Are your proposals on life support? In organisations that aren’t winning enough proposals, I find any number of processes and procedures that are propping up the proposal effort. This calls to mind the life support given to critical care patients to keep their vital organs going. Life support may help to sustain life, but it doesn’t deliver any kind of quality. What would happen if you unplugged your status meetings? Tollgate checks? Draft reviews? Content library? What about graphics support? Would your proposals be able to live, breathe and take on a life of their own when they leave your door, and find their way in front of the customer? Unfortunately, in many cases, the answer is “no”. Your proposals live or die on the quality of effort, energy and enthusiasm you get from your people. They are the vital organs that give life to the body of work you want to do. Does your team know how to build a pitch strategy that represents what the customer most wants, what you can best deliver, and what positions you most favourably against competitors? Can they analyse and answer the question behind the question in a customer briefing or tender request? Do they know how to structure their writing so that it is clear, convincing and compelling? Are they truly committed to making your proposals the best they can possibly be? If the answer to any of these questions is “no”, then you need to make this a priority. Just like the human body, your organisation’s proposal effort needs all its vital organs working together. And when it comes to proposals, withdrawing life support is not an option. You simply can’t afford to let your proposal effort pass away – there are millions of dollars riding on its success. Once you get the life back into your proposals, everything gets better. You’ll start winning again. You’ll get to do the work you deserve to do – work that builds your profile, your bank account and your legacy. Your people will be happier and more enthusiastic about winning work. And that’s an outcome worth investing in. When writing a proposal, it can be tempting to ignore the areas where you know you’re going to come up short. What if you have less experience than competitors, or a less than stellar track record with a customer you are desperate to retain? Unfortunately, glossing over the issue isn't going to work. Competitive tendering is built on the idea of “contractual trust”. In other words, as a buyer, I trust you if you meet my minimum standards; are prepared to sign a contract that binds you to these standards; and where I have legal redress if you don’t perform. The other types of trust – competence and goodwill – are harder to establish, because they are based on how you operate on the job. While presenting past performance data does go some way towards establishing trust in your competence, it’s harder to foster goodwill in a proposal, particularly if you have no prior track record with the customer. "I won't waste your time inflating my credentials, throwing around exaggerated job titles, or feeding you a line of crap about how my past experiences and skill set align perfectly for an investment banking partnership. The truth is, I have no unbelievably special skills...but I do have a near perfect GPA (grade point average) and will work hard for you. I have no qualms about fetching coffee, shining shoes or picking up laundry, and will work for next to nothing." A proposal is a lot like a job application. Any time your proposal is not congruent with who you are and what you can do, it’s like an instant red flag that will send the buyer searching for other holes. There's a good chance you will spook them and never know why they suddenly went cold on you. I know incumbents who have lost business simply because they haven't owned up to problems that are obvious to everyone. Likewise, I have seen long shots win by being up-front and honest about their shortcomings, and by demonstrating a willingness to work and learn (just like Matthew Ross did). Selling is a kind of energy exchange; it is always about people and what they believe about you. Customers will expect you to have the right skills, products and services, but they place a higher value on attitude than you might think. That’s because nothing is ever perfect. When things go wrong in the job, or the relationship - as they inevitably will - they want to know you're the kind of person they can work with to find a solution. This is tip no. 2 in my most popular e-book, 10 Easy Ways To Write A Better Proposal Today. Identity is at the core of every buying decision. Because we all buy things, we can all get better at persuading others to buy – otherwise known as “selling”. Selling requires the ability to put yourself in another person’s position, and to appeal to their identity - whether you’re selling to consumers or to business buyers. The “I Bought A Jeep” campaign is a good example of how identity affects purchase behaviour. This campaign, launched in 2012, has become part of the Australian cultural vernacular. The advertising firm behind the campaign, Cummins&Partners, discovered that although Jeeps were very popular with the people who already drove them, the brand was struggling to reach new customers with its previous ad campaign slogan, “Don’t Hold Back”. Qualitative research with current Jeep customers showed that most of them had experienced an “incredulous” reaction from family and friends when explaining they’d bought a Jeep (“you bought a WHAT??”). Jeep’s brand values are freedom, authenticity, adventure and passion, and the ads tap into a customer’s desire to live those values - not just buy a car. This campaign won two Silver awards at the advertising industry’s 2014 Australian Effie Awards. The agency’s submission to the awards committee shows that the campaign had dramatically increased sales for the parent company, Fiat Chrysler, in a difficult car sales market. Since the start of the campaign, Jeep sales increased 156%, outgrowing the SUV category by 300% while also reducing media expenditure per unit by 45%. “…because we found a way to appeal to the buyer’s identity”. Legendary management guru Peter Drucker said that the purpose of a business is to create a customer. But in practice, what many of us spend our time doing seems to run contrary to this purpose. Last week we considered the idea that there are thee primary internal barriers to business development – practical, structural and psychological – and looked at the practical barriers. These include lack of access to product information, marketing collateral, competitor research, or any one of a number of other things that we think we "need" in order to get out there and talk to people about what we offer. · Treating business development as a function, rather than a goal. 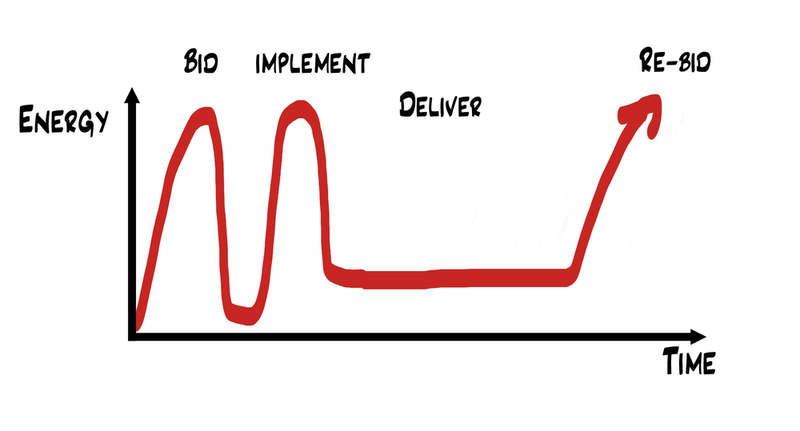 This is what happens when we employ a salesperson or business development person and expect them to carry everything, while the rest of the business sees their responsibilities as simply to “deliver” on what they sell. This just doesn't work anymore (if it ever did). The most successful businesses are those where everybody is responsible in some way for business development. There’s no way that one person, or even a small group of people, can do everything that's necessary to create, present and deliver value for a customer. · Process for the sake of process. Particularly in larger and older businesses, it’s common to see processes that have been set up to suit the business, and not the customer. When someone says "this is the way we've always done things", it's a sign that this is an area that has become internally focused and is probably detrimental to delivering value for a customer. Processes should make things easier, but in fact often make them damned difficult. · The way we spend our time. Most of us spend way too much time on things that actually aren't very important, and not enough time on things that are. How much of your day is spent answering email? In meetings? Completing reports? Resolving problems for other people? Now, how much of your time do you get to spend on actually building new things, and creating value for customers? When we spend all our time reacting to things, we’re not creating anything new. And when we’re not creating anything new, we are not building anything valuable for customers to buy. Is your structure holding you back from achieving the success you deserve? Peel back some layers and ask whether they are creating, or inhibiting, value for customers. What is the legacy of short-term thinking? Short-term targets and short-term thinking are stifling the growth of too many businesses that should be doing much better than they are. Last week, SmartCompany reported the results of MYOB’s most recent Business Monitor survey, revealing the top 5 pressure points for small and medium enterprises. The top two were “attracting new customers” and “pressure from competitive activity”. Not surprisingly, pressure on profitability and price also rate highly among businesses that have experienced a decline in revenue this year. There’s no doubt that conditions are challenging, and probably will be for some time. According to Deloitte Access Economics, economic growth here in Australia is expected to remain below its long-term average until 2017. But short-term thinking is not the answer. There are opportunities out there, as long as we are prepared to do the work and planning it takes to land them. Remember The Young Ones on TV in the 1980s, with everyone’s favourite hippie Neil earnestly explaining that “We SOW the seed, nature GROWS the seed, then we EAT the seed”? It’s funny because it’s so obvious, and as it turns out, much easier to say than to do. Pressure to attract new customers, coupled with increased competition and fewer market opportunities create the perfect environment for a game of chase-your-tail. It’s one thing to be powerfully motivated to move away from what we DON’T want. But until we have a clear idea of what we DO want, we may see a lot of activity, but also a great deal of fear and confusion that will hamper results. This year, the stock value of Amazon.com ($248b) overtook the stock value of America’s largest bricks-and-mortar retailer, Walmart ($233b) for the first time. Jeff Bezos, founder and CEO of Amazon.com, doesn’t take this for granted. “If we have a good quarter, it’s because of work we did 3, 4, 5 years ago. It’s not because we did a good job this quarter,” he says. The work we do today on our business model, products, services and customers may not bear fruit immediately, but without it, there will be little to harvest in the long term. The downtime over Christmas and New Year is the ideal opportunity to reflect on the rewards you’d like to reap next year, and what you can sow now to make it happen.